This musical prequel to The Wizard of Oz addresses surprisingly complex themes, such as standards of beauty, morality and, believe it or not, fighting fascism. Thanks to Winnie Holzman’s witty book and Stephen Schwartz’s pop-inflected score, Wicked soars. The current cast includes Jackie Burns as Elphaba and Amanda Jane Cooper as Glinda. We have seen wicked twice this year. I can't believe that this site only rates it 4 stars. This show is so outstanding that I cannot give it high enough praise. After seeing it in February, we flew back to New York in March to see it again, with front row seats. Plan to shed years and scream with joy of you go. It is that good. The storyline takes so many turns and builds to a crescendo that is mesmerizing and fantastic. Go! You will be changed for good! One of my favorite shows on Broadway ever! I first saw the show with the original cast including Idina Menzel & Kristen Chenoweth, and fell in love immediately. I've been back a few times since and have loved it each time! The story is great, the actors & actresses are incredibly talented, and the music is so catchy. I cannot believe that I just saw Wicked for the first time recently. It's been running for so many years and i finally got around to seeing it because of the Broadwa 2 for 1 deal. Man I have been missing out for SO LONG. The plot is absolutely phenomenal. I loved it because it explained a lot of the events that occur in the Wizard of Oz. I always thought the Wicked Witch was.... well, Wicked. After watching this show, I feel like such a fool. The cast is absolutely amazing and I think this is one of the best shows I've ever seen so far. Go out and see it! You won't be disappointed. Wicked is by far one of my favorite Broadway plays ever! I love the music, cast (Idina Menzel & Kristin Chenoweth) and the story of Glinda and Elphaba. It's a clever twist on the original Wizard of Oz and pays tribute to how two unlikely people form a great friendship! Do you like those big American Idol performances that seem to scream, "I can sing loud! And high! And look at me!". This is a little bit like a series of those. Which can get a bit much, or rather would get a little much, if the story and book weren't so sharp and engaging. Wicked was my first participation in Broadway Week ever, and I was not disappointed one bit! It had a bit of a bumpy start (characters are not very dynamic or instantly relatable - yes, Glinda is instantly funny, but her character really begins to identify about a quarter of the way through the show), but they eventually grow into very complex individuals with tumultuous relationships that anyone can relate to. Glinda had us laughing out loud, our hearts ached along with Elphaba's, and I appreciated the clever ways they referenced the original Wizard of Oz (I love that part of this story takes place during the time Dorothy is in Oz, filling in some of the gaps of what was going on in the rest of Oz during her residency). Overall it's a very enchanting story with some great twists and clever writing that makes it a must-see on Broadway! 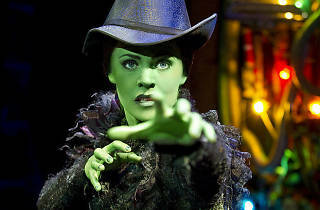 Honestly, Wicked has become a Broadway staple, seeing as it will not go away any time soon, as rightfully it should not. Though the story line can seem a bit bumpy in certain areas, especially in the teen problems camp, the true heart and soul of the show is Glinda and Elphaba. If played by dynamic actresses, the show manages to steal the heart of all those who see the show. For the young teen population the show seems to attract the most, many can find a part of either Elphaba or Glinda to identify with. "Defying Gravity" always manages to take my breath away (seen this show three times!) and the tale of friendship won and lost always strikes a chord. I personally think this is the best musical ever. The songs are fantastic and the story line is brilliant. I would recommend it to anyone.